JJ started doggie day care today at Pouncing Paws. This is the same place where JJ gets groomed. Pouncing Paws is the grooming place that clips JJ's paws by hand with scissors because he freaks out when electric clippers come anywhere near his little footsies. Remember that's the very reason Grandma J left the last groomers. They were all men....not JJ's favorite people, and they muzzled JJ when they buzzed his paws, and they made JJ cry....UN.ACCEPT.ABLE. 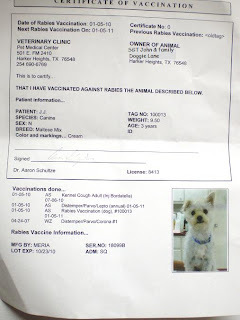 Before JJ could start doggie day care, all sorts of paperwork had to be filled out, and background checks done. Here is a copy of JJ's background check, complete with mug shot. On the way to JJ's first day at doggie day care, Grandma J told him all about the fun he would have, and the friends he would make. A high level of excitment filled the air....and the car. We pulled right up to the front of the building. Word was out that JJ was coming because some of his classmates were waiting with gnarling teeth bated breath when we showed up. Luckily this isn't the entrance door...it's just a door that pretends to be a window in the "big boys" playroom. JJ is paid up for ten play dates. Grandma J is so happy he's going to make friends. Maybe he can have his birthday party there. They do those at Pouncing Paws, yes they do. That kitty video at the bottom of your blog is FUN!!! Knee!!!!!! Good that you can take him to have fun with other dogs. Knowing Killeen, there are a large proportion of rotties and pits, but I'm sure they play with proportional dogs. The other thing is that most smaller dogs have no idea they are small in the first place and end up running things. There's an appliance commercial airing lately with Kelly Ripa and her children are having a doggy birthday party - it is so cute. I hope these visits go very well. You have a nice weekend. That's a precious mug shot! I would love to spend some time here..but please don't make me get a rabies shot!! I hope JJ has fun! I can't wait to see JJ's report card. I hope it goes well! Our dog gets scared to death whenever he has to go in the car anywhere. He just shivers and shakes all over. He is always so happy to come back home again. We had to go to a different groomer than usual due to our regular groomer being unavailable one time. The new one used a muzzle on him while clipping his hair. That was the last time we took our dog there. That has to be the cutest mug shot I've ever seen. That dog MUST come to Blog Fest. JJ is one lucky hot dog! I used to laugh at the concept of doggie day care but now I understand. What did he say afterward? Did he have someone to sit with at lunch? Any cute girls? That little JJ has too much fun! I love that you gave him a pep talk! I know he will make lots and lots of doggy friends! JJ is such a little charmer he will everybody including the big guys loving him. How did your baby do? Hope it went well!